If you have a keen interest in yoga, you can now take it further with the help of Stretch City. Stretch City is a yoga-inspired website that has an online directory of yoga studios, shops, organic restaurants, events, and promotions related to wellness and eco-living in Singapore. The brain behind Stretch City is international model and artiste Liv Lo, who came up with this idea to have one place online for the yoga community to gather. Together with yoga instructor Yun Ng, they listed 59 restaurants, 45 shops, 57 studios (and counting). Stretch City will also organise yoga events and retreats monthly, with special pop-up concepts will be held all over the city exclusively for its members. The aim for Stretch City is to make it the preferred yoga portal where members will be the first to receive exciting details on all upcoming events and promotions through its mailing list. Q: When did you first get the idea to set up Stretch City? A: When I moved to Singapore last August and took my yoga teacher training, I learned that yoga encompasses more than just the physical exercise. Yoga includes the way we eat, what we buy, and how we treat our self and others. I discovered that yoga is a healthy lifestyle that everyone can enjoy. Stretch City is of a yogi traveling through a city and mapping out the journey online. She shares the places she loves, what she buys, and writes about who she meets. You can say that Stretchcity.com is a health map of the city or a yoga-based wellness guide with a yogic voice. Q: How long did it take to set up Stretch City from the point where you first got the idea to the launch of the portal? A: It took about six months to start. It started as an idea, but after wire framing my mind map I realised that I had to create a team to make this work. I sourced and found a wonderful team of designers, programmers, and partners to work with. I really knew that the site would work when the blueprint attracted large health industry players to contribute to our site. We have monthly interviews with persons of interest such as Denise Keller, Emmanuel Stroobant and partnerships with some of the biggest yoga institutions like Hom Yoga, Updog Studio, The Living Café, Canvass, Touch the Toes and more. 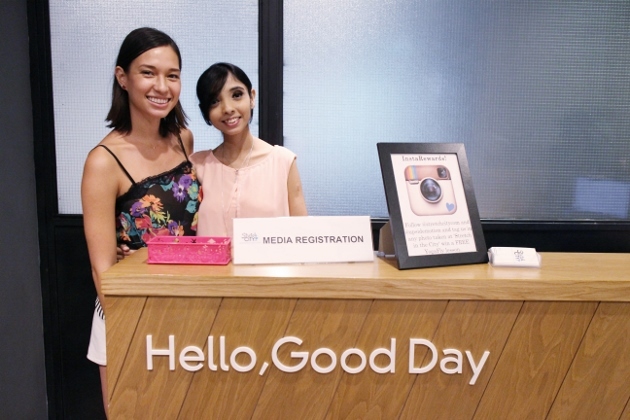 Our aim is to join the community and create a voice or forum on the best and healthiest location in Singapore. Q: What are your goals for Stretch City? How far and where do you want to take it to? A: Wow, this is a big question. My goals for Stretch City are to provide great content for our community of members, affectionately called Stretchies, of regular SC events and sales. Our promotions section offers yoga apparel sales, restaurant and class pack discounts while our events section gives Stretchies opportunities to meet, eat, and practice yoga together. Q: When did you first discover yoga? A: I first discovered Yoga in Taipei, Taiwan in 2005. I was 20 at the time and had been interested in it for awhile; however, it wasn’t until a friend dragged me to a 7:00 am class at John’s Yoga Living in Taipei city that I started on my eight-year long journey. Q: What was it about yoga that kept you practising? A: It is no doubt that yoga is tough even for a long time practitioner like myself. Yoga is always different every time I practice. Different times of the day, different temperature, different teacher…it’s never the same. Even finding time to get on the mat can be tough. But, when you do, you get time to zone out. A blissful 60 minutes all to yourself with no phone or cares. It’s just you, your breath, and sweat. Unification of your mind, body, and breath. That is what I love about yoga. Q: Why did you decide to get a certification in teaching? A: I decided to get certified during my move from Tokyo to Singapore in August 2012. It was during this transitional period that I took 30 days to complete this 200-hour Hot Yoga teaching programme. It was definitely grueling as we practised two sets of 90-minute Bikram-based yoga classes per day for 30 days. I am so happy I got this certified back then as my current filming schedule for Point of Entry Season 4 requires me to be on call everyday for three months. Now as an actress, host, entrepreneur and model, I do not have the luxury of having a set schedule. Stretch City is my creation and the way I teach about yoga and it’s benefits to a wider audience. Q: How often do you practise yoga? A: I practice as often as possible. Usually twice a week or more at Pure Yoga or at home. If it is at Pure I will take a 60-90 minute class. If it is at home I will mix yoga in with a 40-minute cardio regime. Q: What types of yoga do you like best? A: My favorite has to be, both hot or cold, Hatha or Hatha-Vinyasa. Knowing that there are different styles of yoga that people like. I developed a ‘filter’ function for people to find which studios offer the style of yoga they like. We also list upcoming trainings and workshops all with early-bird discounts. The events section holds various yogic activities such as juice cleanses, raw food classes, retreats, and more! Q: Tell us more about the health benefits of yoga. A: I could go on for days about the health benefits. I am not a doctor, expert, or coach, so I can only speak from my personal experience. The health benefits are innumerable and immeasurable as yoga benefits the mind, body, and soul. We are so busy everyday thinking about what we need to do that we forget about the basic elements of life like breath. Listening and following your breath during your practice calms the mind and syncs us with our energy. We are constantly bombarded by outside elements that are harmful to our body. The physical practice of yoga realigns, strengthens, and keeps our systems healthy. Nurturing the mind and the body keeps the soul happy and at peace. Q: How does yoga fit into your fitness regime? A: Yoga complements any other regime. I do simple stretches, twists, and handstands against the wall to complete my cardio workout. I am a very active person (even on holiday) and love to swim, bicycle, motorcycle, jog, hike, kayak, and water ski. Q: How big a part of your life is yoga? A: Yoga has influenced the way I eat by teaching me through my body. After a practice I do not crave for fried chicken, but clean wholesome fruits and vegetables. I stopped eating fast-food and limit my meat intake to one meal a day. I do believe we are what we eat and that food, good or bad, affects what we do, think, and how we look. You can find me regularly eating or hanging out at any of our restaurant listings. Don’t be shy and say ‘hi’ if you do! Q: What are some of the misconceptions about yoga? A: That you have to be flexible to practise yoga and that everyone is naturally bendy as they are to being naturally skinny. Impossible! You will not touch your toes just because you command yourself to ‘touch your toes’. It takes years of practice and every posture is different. You will be good at some and not as good at others. Like everything in life, work at it and you will achieve it. Q: How would you convince a non-yoga practitioner to try yoga? A: Yoga is 5,000 year-old practice that has been tried, tested, and has lived through the ages. Yoga is suitable for everyone no matter the age, height, or body type. In fact, as long as you are breathing, you are able to practice. If you give yourself a chance and stick to the practice, then you will be able to experience what everyone is raving about. Q: Many people often find yoga more suited for females than males, how would you tell others that yoga is actually for everyone? A: Women often find yoga easier because of their flexibility; however, men are often stronger physically so they find strengthening poses and arm balances easier. Yoga is a balanced exercise and will challenge each student in different ways. Yoga is not a competition and if you are busy looking at how other students are practising then you are doing it wrong. Listen to the teacher and let them guide you through your practice and experience it for yourself. *This interview was made possible by Zareena, an independent publicist for ‘Stretch in the City’, the official launch event for Stretch City last week. Liv Lo hosted ‘Stretch in the City’ for media and guests, treating them to an afternoon of yoga performances and firsthand experiences on healthy living through interactive health and beauty workshops at Upside Motion’s new City Hall studio. The day began with a beginner YogaFly trial class led by Upside Motion yoga instructors, followed by two sets of yoga demonstrations and an interactive session of sponsored health and beauty mini workshops. 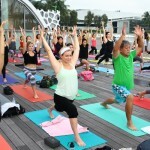 Shortly after the YogaFly demonstration,a 20-minute outdoor Acro Yoga performance was led by Stretch City director and professional yoga instructor Yun Ng. Guests were served healthy detox drinks by Sana Cleanse and treats in eco-friendly cornware lunchboxes by VeganBurg. Representatives from Mekhela also walked around with tea and rice paper rolls for guests to sample. LINS Smoodees gave ‘live’ demonstrations to show guests how to make their own fuss-free green smoothies, Militza Maury showed how to make translucent facial powders and The Rawyal Kitchen held a Raw Foods Talk with specially prepared raw dessert served to guests. There was also free consultation with Sara Varela, a wellness coach, trainer and speaker from Positive Living.